Exeter Floor Restoration LTD is an established company based in the South West of England. We provide services that use the latest techniques in stone restoration and concrete polishing. With our state of the art HTC and Werkmaster machines we can carry out high end finishes on either material quickly and efficiently. Our award winning highly skilled team can cater to all your hard flooring requirements. With 33 years of surface machining expertise we stand alone in the area with our ability to polish hard floor surfaces. Uniquely we also carry out full installations of polished concrete. Basically we take the floors on at the insulation and underfloor heating stage to a finish floor. We install all the reinforcement, concrete, power float the concrete, install shaker finishes if required or seed the concrete with recycled glass etc and then carry out the concrete polishing process. We have a 130 sq/mtr area in our unit where we test tooling, these include a polished power floated area, another with various aggregates exposed and one seeded with blue reycled glass, these can be viewed by appointment. We cater for the domestic and commecial sectors. Domestically we carry out floor grinding to pre laid marble, terrazzo, granite and limestone floors where the surface finish is poor or where the floor has been poorly laid and lippage needs to be removed. We also provide a service for domestic concrete polishing. Many companies stay away from this with the thought of the edge work and the hassle of bringing machinery into homes, we though will be happy to give you a quotation. Commercially we cater for a wide varity of sectors from developers to airports. We carry out work for Kier, Willmott Dixon, Morgan Sindall, Mansell, Dawnus Construction and many other major companies. 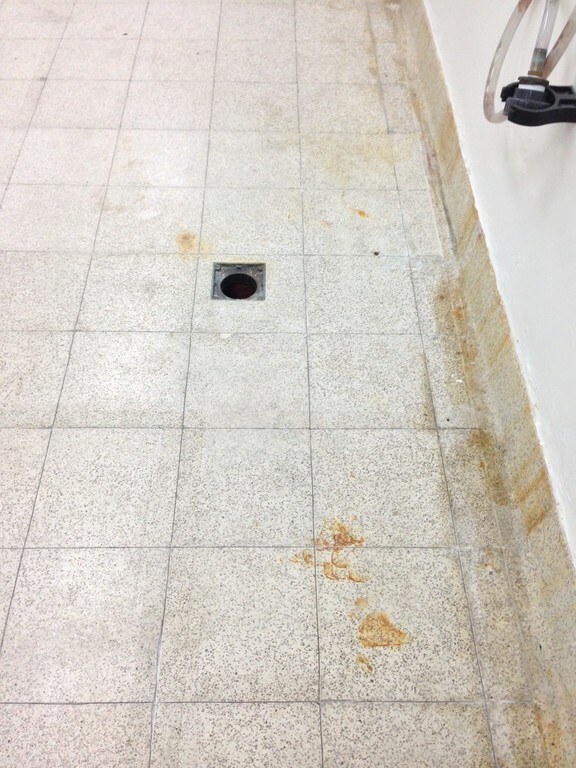 Much of our work here is floor prep, concrete polishing, restoration and terrazzo grinding. We are unique in many ways especially because all photographs used on this site are from work we have carried out, this speaks volumes about who we are. No need to hide behind glossy web pages with pictures ripped from other companies sites. We are the only company in Devon with the equipment to produce HTC Super floor concepts. We have invested heavily over the years to ensure that we stay infront when it comes to hard floor surface machining. We own several large Werkmaster machines the Colossos XT is the biggest in the range, this one is also the only electric one in the UK. With its 20hp motor and 840lbs of weight coating removal is a doddle along with high finishes on both concrete and terrazzo. Terrazzo courtyard area floor at Exeter Museum. We ground and polished this before sealing it with SIG products. Rectification work to an existing floor in Farringdon Street London. The floor was in a terrible state, heavily scratched with patches of sealer missing and a very uneven finish. We mananged to bring the floor up to a very high maintainable finish. 125 sq/mtrs of HTC Bronze, power floated concrete then polished to 3000 grit then sealed. Large contract at JP Morgan. 800 sq/mtrs of limestone floor restoration and staircases. Appoximately 300 sq/mtrs of power floated polished concrete installed in Wollacombe. 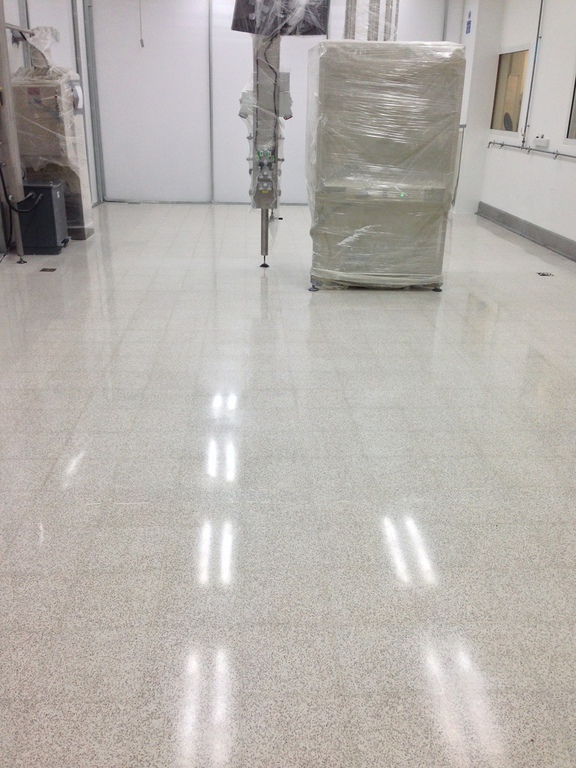 This picture shows the largest polished Belitex C screed floor in the UK which we polished to 1500 grit. The Belitex had a charcoal pigment added which helps to emphasise the small white aggregates in the mix. 186 sq/mtrs of polished power floated concrete at a barn conversion in Doddiscombleigh. A granite aggregate and sand concrete floor installed near Plymouth, full aggregate show with a gloss finish. 202 sq/mtrs of polished concrete installed near the Tamar Lakes. This floor had Qualidur shaked into it to increase the fat layer. Polished concrete at the new Winery at Swannaford House. The concrete was supplied by Devon Concrete at Crediton, floor sealed with Ameripolish SR2. 113 sq/mtrs of Mapei Ultratop installed near Honiton. The patio area is also a polished power floated floor. First pour for Yeovil Colleges new carpentry unit. This is a light grey dry shake with Sika pro seal to finish. Polished power floated floor near Exeter. Concrete came from Wiltshires near Torquay. 960 sq/mtr power floated floor installed with shaker finish in Shaftesbury. Polished power floated floor at the new Salcombe Distilling Company Ltd.
Refurbishment for the council offices at Naisea. Sealers were stripped back and the concrete was re polished before being re sealed. Polished power floated concrete floor. The floor generally retains power floating swirl marks with a high finish. Only 0.5 to 1mm is removed from the surface during the process. 820 sq/mtrs of polished power floated concrete finished at the Heatherton Park Studios. Polished concrete installed in Exeter. We seeded the surface with recycled green glass, its not an easy process but transforms concrete giving it another dimension. Polished concrete installation at Sheppy Cider near Taunton. This is an existing power floated slab that has been polished to expose as little aggregate as possible. Polished power floated floor near Hungerford. It is critical with these floors to get the installation correct. Hatherton Park Studios. Installation of 820 sq/mtrs of polished concrete and cement over toppings. Floor consists of a ground floor and upper deck both floors have been power floated ready for polishing. Polished power floated floor in Bristol. Polished power floated concrete floor. We are the only company in the Southwest with a dedicated concreting service which enables us to do the full installation from the insulation up. We can lay up to 1,200 sq/mtrs a day. 1350 sq/mtrs of floor prep in the centre of Cardiff, 4.5 tons of carpet glue and self levelling compound. 634 sq/mtr Terrazzo floor at Dike & Son in Stalbridge. 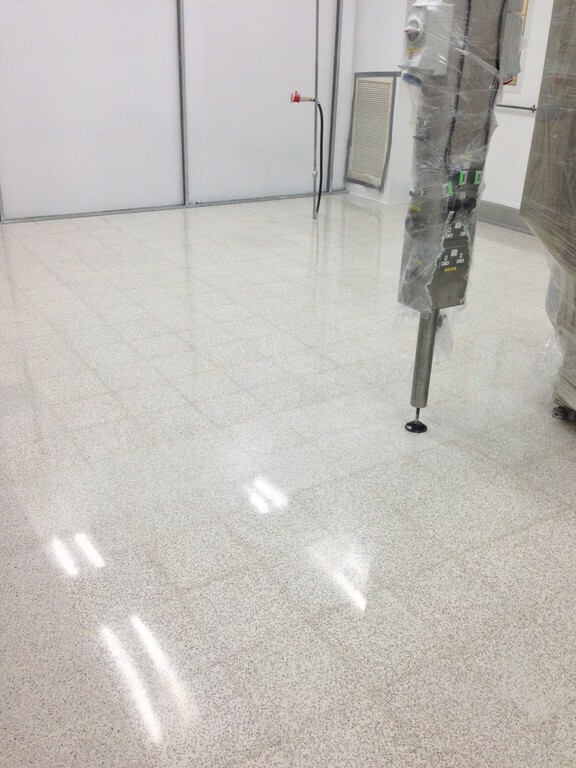 This super market floor has been extensively repaired and ground and polished to 1500 grit. 180 sq/mtrs of terrazzo tiles laid, ground and polished for Artigino's new restaurant in Exeter. 300 sq/mtrs of HTC Superfloor for Majestic Wines. 326 sq/mtrs of polished concrete at the new Jurassic centre,Seaton. International contract in Montenegro. 350 sq/mtrs of terrazzo restoration. 220 sq/mtrs of polished concrete in Broadclyst. The floor included a laser cut steel emblem which was polished with the concrete. 200 sq/mtrs of polished concrete for Solentim in Wimbourne. Limestone floor ground, polished, powder polished and sealed. 320 sq/mtrs of power float polished concrete also known as HTC Bronze. New warehouse facility for Gregoreys transport. We resurfaced 2250 sq/mtrs of power floated concrete. This was is a polished concrete floor that we recently rectified in North Devon. A company called Stone-Restoration from Holsworthy had left the surface with a poor finish, tooling marks, holes and it was exposed to any amount of staining. Hardwood floor in the dining room at Southernhay House Exeter. 100 sq/mtrs of Jura limestone re ground and polished in Bridport. 89 sq/mtrs of St Alban limestone in Branksome, Dorset. 65 sq/mtrs of polished concrete in Didworthy, South Brent. Terrazzo floor areas at Pall Corporation UK Ltd. All the grout lines removed and replaced, floor ground and polished before sealing. 110 sq/mtrs of limestone in Plymouth. Very intensive lippage grind, now the floor is seamless with a very high finish. 108 sq/mtrs of travertine in Bradninch. 330 sq/mtrs of polished concrete in a barn conversion near Okehampton. Below are sample shots of some of the finish grinding we have done. You can decide the finish you want, remember the higher the finish the easier the maintenance!. Professional and award winning services available throughout the UK. Concrete polishing, polished concrete, concrete polishing, concrete polishing, Devon,Devon,Devon,Uk,Uk,Uk,SouthWest,SouthWest,SouthWest.Natural Stone restoration, Natural stone restoration, floor grinding, floor grinding, marble grinding, marble grinding, limestone grinding, limestone grinding, Floor preparation, floor preparation, floor preparation. Devon, Devon, Devon, Devon, Devon, South West, South West, London, London,London,London, London, London, London,London, London,London,London,London,London,London,London,London,London,London,London.